One of the greatest kayaking feats ever completed – the solo journey from California to Hawaii. 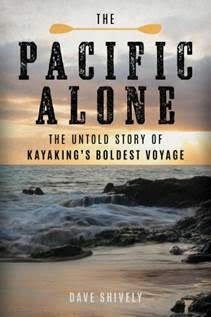 In Dave Shively’s book, The Pacific Alone: The Untold Story of Kayaking’s Boldest Voyage, he chronicles the amazing odyssey that Ed Gillet accomplished in the summer of 1987. Starting in Monterey, California, Gillet set out in a 20 foot, tandem kayak on this 2,400 mile voyage, using a plastic sextant to navigate and about 600 pounds of gear, key amongst the gear was a reverse osmosis water maker (his fresh water source) and 60 days worth of food. He paddled 12-16 hours at a time and on days when there was a welcome trade wind, averaged about 60 miles per day; however on days when there was no wind, he averaged about 20 miles. After 64 days, enduring a broken rudder, a failed communication transmitter, countless sleepless nights, burning salt water sores, and a lost dry bag filled with kitchen gear and mood-lifting instant coffee, he finally landed in Maui’s Kahului Harbor. The Pacific Alone: The Untold Story of Kayaking’s Boldest Voyage is the triumphant story of Ed Gillet’s solo, human-powered crossing that will leave you inspired and awed.